David- "Your.... I&apos;m gonna be a dad?" David- "OMG IM GONNA BE A DAD! OMG LIZA!" David- "Of course I am! That&apos;s all I&apos;ve ever wanted a family! And I get it with the love of my life!" 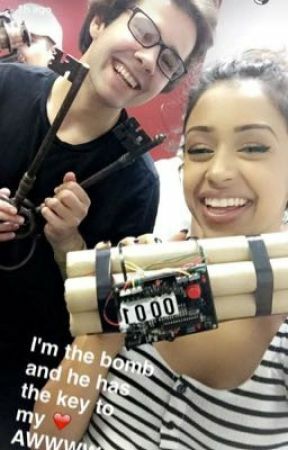 Liza- "Omg i was so scared. I thought you&apos;d leave me I thought you wouldn&apos;t want it"
David- "Liza. Don&apos;t you ever think like that, I&apos;m so happy that I&apos;m having a family with you. I love you"
Liza- "I love you to baby"
David- "We need to tell our parents and everyone else and book a doctors appointments omg there&apos;s just so many things to do I&apos;m so excited!" Liza- "Haha I know babe so am I, Gabbie already knows. It&apos;s quite late do you wanna eat then just go to bed?" David- "Yeah sure, you sit down and relax I&apos;ll bring it over to you"
David is already in dad mode I&apos;m just so happy that he&apos;s happy and wants to be a dad so bad. I don&apos;t know what I&apos;d do without him. We eat dinner and go to bed. I asked David to stay over again. I think I&apos;m gonna ask him to move him. I wake up in David&apos;s arms, I turn to face him and gentle kiss his cheek which woke him. David- "Hey babe. And baby"
Liza- "Your so cute. Your gonna be such a great dad"
David- "And your gonna be such a great mum too"
After a few more minutes of cuddling we both finally get up and get dressed. I brush my teeth and do my makeup I just put my hair in a bun. parents and tell them and spend a few days with them, sound like an idea? David- "Yeah that&apos;s awesome babe, I&apos;ll go book the flights now you can book the ultrasound" he give me a kiss on the forehead and walking into the living room.